In my last post I had written about the goosebumps inducing legendary story of Diwan Todar Mal of Sirhind who had defied Mughal diktat and had arranged for the cremation of the young martyred sons of Guru Gobind Singh. This incident occurred after the two sahibzadas (sons) of Guru Gobind Singh had been executed by the Mughal authorities for not renouncing their faith and the death of their grandmother out of shock at hearing the news of the execution of the youngsters. 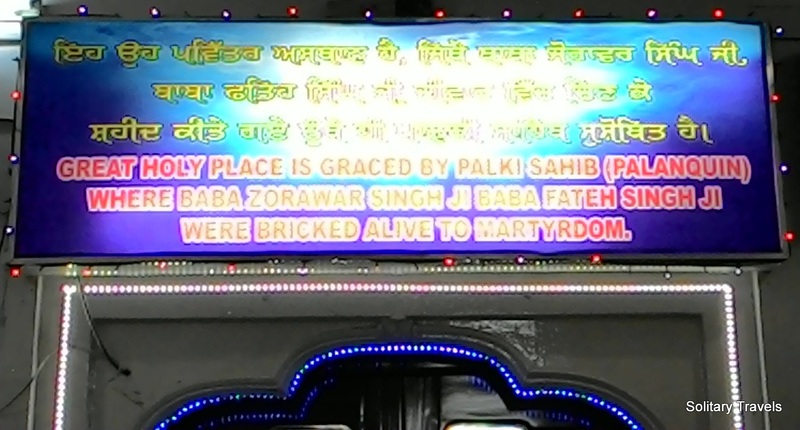 The grand Gurudwara Fatehgarh Sahib holds in its bosom the holy room were the young saahibzadas were bricked alive. The exact place were the martyrs were bricked is marked by an intricately carved palanquin. Besides this holy room, there is enough space all around the basement for devotees to sit and and read from the religious scriptures. The next post in this series would be about the Thanda Burj, the historical cold tower where Guru Gobind Singh’s mother Mata Gujri and his two sons were held captive in bone chilling winters. This episode makes for a fascinating story. Hope you enjoyed this post, please do share your feedback.